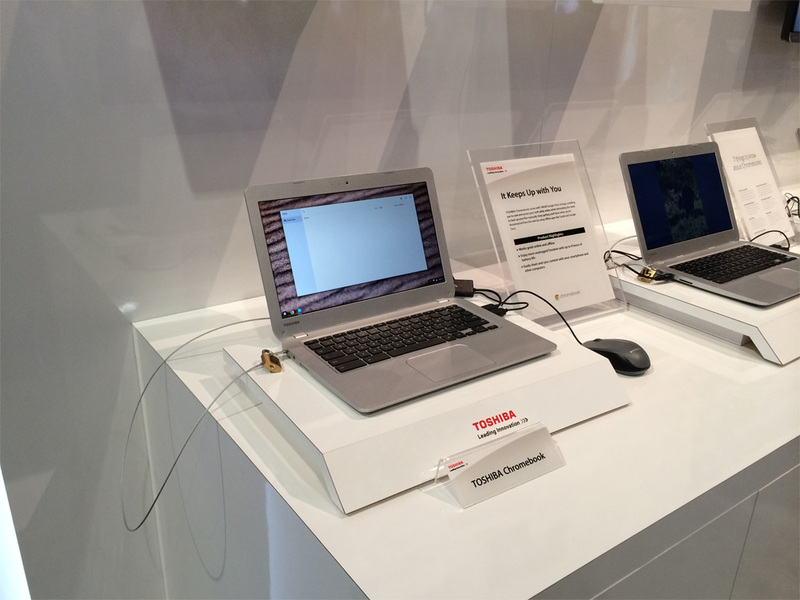 With the number of Chromebooks on the rise, Toshiba is looking to get into this market with their simply-named Chromebook. It’s priced at $279.99, which is about average for most existing Chromebooks. Specifications include a 13.3-inch display with a resolution of 1366×768, an Intel Celeron (Haswell) processor, 2GB of RAM and a 16GB SSD. It also weighs just 3.3 pounds while being 0.8 inches thick. Ports include a few USB 3 ports, HDMI out, headphone out, as well as an SD card reader. Thanks to Intel processor, battery life is expected to be around 9 hours of use. The unit felt solid, but the trackpad felt as though it could use some work, as there was a slight delay when using it. The screen looked plenty bright and crisp, despite the somewhat-low resolution. From a distance, it would be hard to tell this from, let’s say, a MacBook. The Toshiba Chromebook is expected to go on sale on February 16, both online and at actual stores.